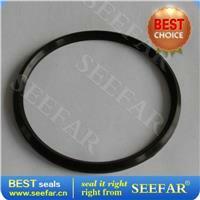 Chem-ring will be flexibility and tightness and the PTFE chemical resistance of the organic combination of fluoride package is a silicone ring or off to allow the core and with a relatively thin PTFE FEP or a combination PFA outside review, This PTFE ring rubber seal with excellent performance. Rubber O-ring easy to wear and tear, corrosion-resistant chemical gas permeability and anti-poor, pure PTFE O ring to a higher hardness of anti-compression, but less flexible. Outside review FEP / PFA O ring with a good anti-swelling and chemical stability (except at a high temperature by the alkali metals, fluoride and the erosion of some of the halide) in the near vicinity of the rubber O-ring have good flexibility, FEP / PFA the friction coefficient is small (only 0.1 to 0.2), and has an excellent anti-gas permeability, which makes performance of Chem-Ring seals can be applied to a real bad environment. chem-ring joints on the surface and even compact FEP / PFA outer coating of rubber inner core and the combination makes Chem-Ring sealing the overall tightness of the line, sealing all points of flexibility and uniform compression, after sustained Still under pressure to repeat the use of the installation. With the increase of pressure on the media, as a whole by the compression ring. Chem-Ring ring as a high-viscosity of the liquid, in its role without the pressure to reduce the transmission go out in all directions. 3. FEP compression of the outer coating makes the existence of Chem-Ring seal has a good anti-sclerosis and anti-brittle at the same time Viton rubber or silicone rubber inner core of the system makes the ring in the high temperature of 205 ℃ to maintain good Flexibility. 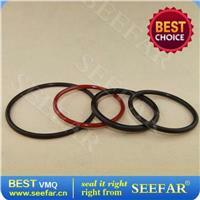 Kalrez rubber, Viton rubber and FEP outside review of the Chem-Ring in the three O-ring seal compression devices in the performance comparison shown in Figure: The test results showed that the silicone rubber or Viton rubber and physical properties FEP / PFA the Chemical properties of the combination formed by Chem-Ring in the ring to maintain the performance of the rubber at the same time has a good compression resistance. Chem-Ring sealing of the need to create a rigorous quality control, through the use of a special polymer technology makes FEP completely wrapped with rubber core, and to ensure that such an O-ring with the required standards of tolerance. Used the information on our Chem-Ring products have good quality commitment, which is based on performance tests and on the basis of strict control in order to ensure customer satisfaction, this product is safe for use. Chem-Ring seals and other rubber or PTFE pure O-ring, are unparalleled and the tightness of long-lived, particularly in the application of harsh media. Mori made the Chengdu Co., Ltd. is a high-performance rubber seals manufacturer, we have produced Chem-Ring seal the series have a stock size, Chem-Ring inner core can provide silicone rubber and two Viton rubber material, outside FEP review of the Chem-Ring If there are no stocks, can be available within 4 weeks, if needed, special circumstances may be available within 7 days. 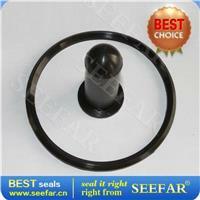 The solid circles chem-ring, a large number of applications with static and dynamic seal in sealing. The hollow silicone rubber Chem-Ring sealing the wire diameter in general do more, the application of static seal, its hardness and anti-compression than solid low-Chem-Ring ring.